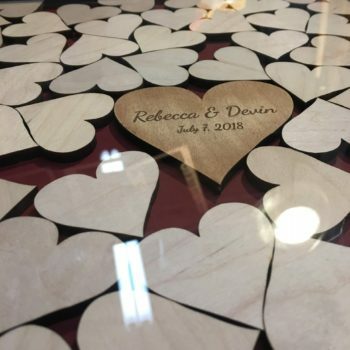 Our drop top guest books are unique, elegant and a notable addition to any wedding or event. 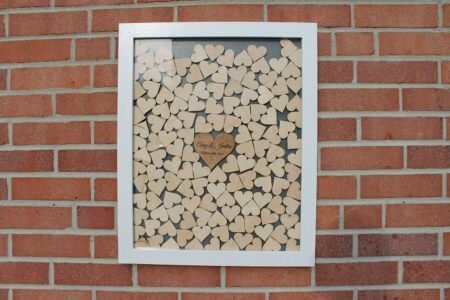 A great way to involve guests in creating a treasured and memorable item which endures a lifetime. Leave a basket or jar of pieces on a table. 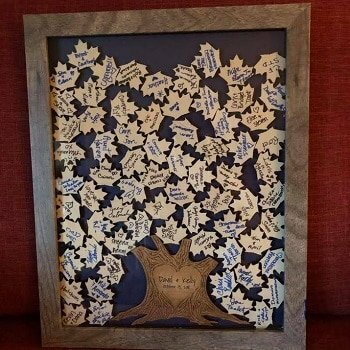 Guests sign a piece and drop it in the frame. The result? 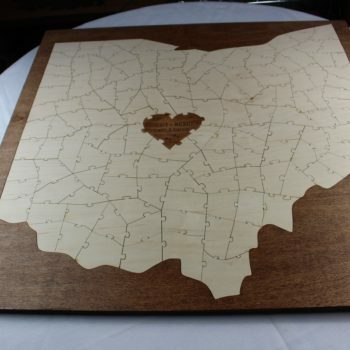 A beautiful piece you can hang on your wall to memorialize the event. 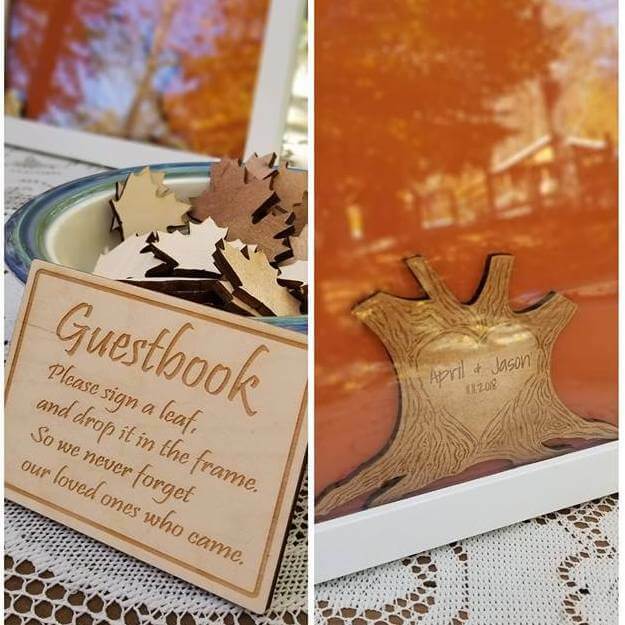 The two main styles of drop top guest books we make are the heart and tree. There are three frame colors to choose from: black, grey, or white. Go for a chic look with the black or white, or a rustic wedding theme with the weathered grey. You can choose any color under the sun for your background color. Every color looks great. 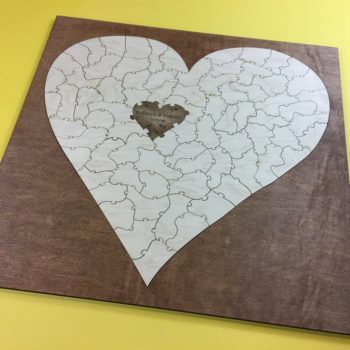 We will either hand paint it or cut out thick quality paper and glue it to the backing. Whether it’s a small wedding or gigantic party, each drop top can hold as few as 20 pieces or up to 215 pieces. 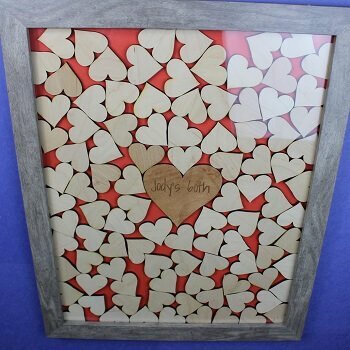 The leaves and hearts come in different sizes, so each frame size holds a different amount. 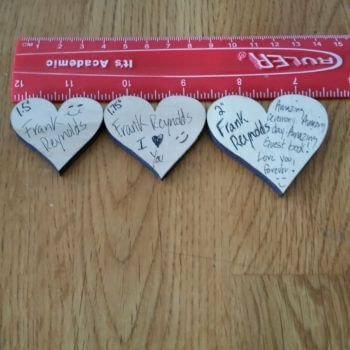 They are either 1.5″, 1.75″ or 2″ in diameter. 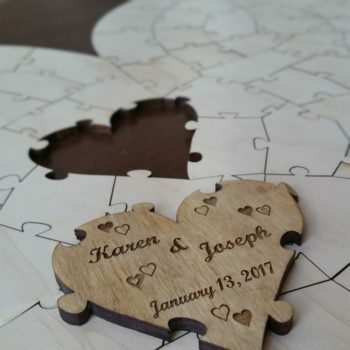 For a wedding, you’ll probably want 1.75″ or 2″ pieces, as they allow a bit more than just a name to be written on them. 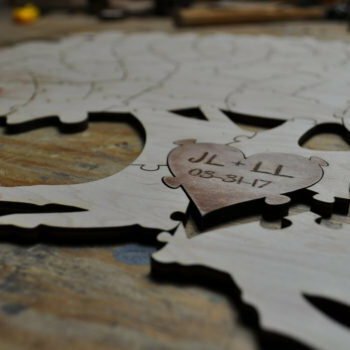 Each drop top has a personalized piece laser engraved with the text you desire. 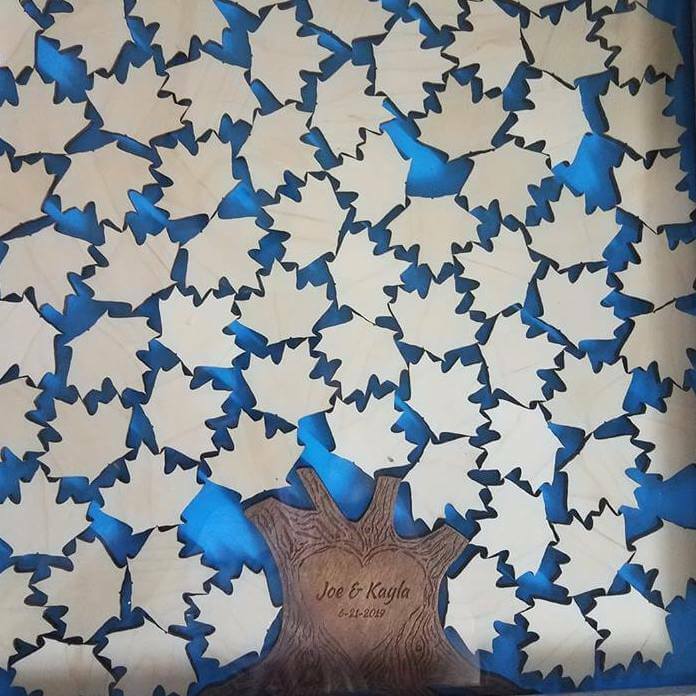 This may be a tree trunk, a heart, or another custom shape. 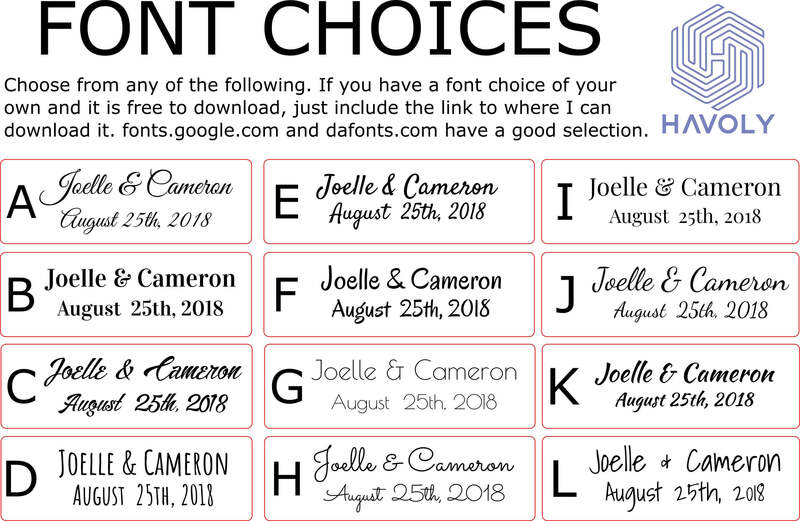 You can always choose the font from one of our selections, or provide your own font if it is free to download. We always format the text you provide to look as best as possible. Which is almost always in two lines of center aligned text, with the names a slightly larger font than the date. 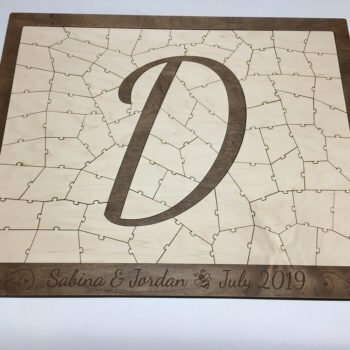 In the case of two first names (or Mr. & Mrs.), a last name, and a date, we break this into 3 separate lines, with the last name being the largest in size. How many pieces does each size frame hold? 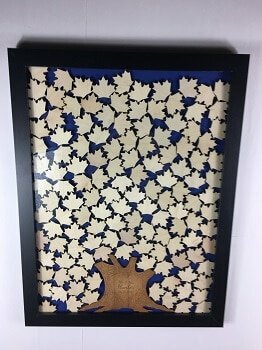 Remember, each size frame holds a different amount of the 3 sizes of leaves. Consult the chart to see which size will work best for your wedding or event. 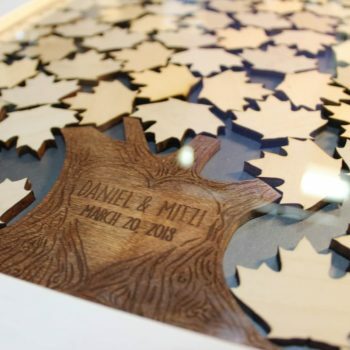 For example, if you’re having a wedding and expect 150 guests, we suggest a 16x20 frame with 1.75″ leaves. 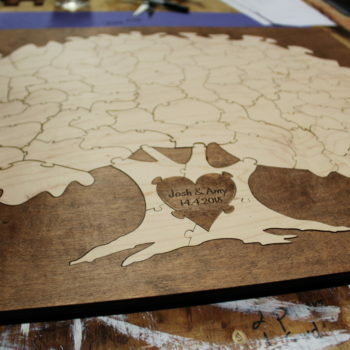 You’ll probably even be OK with the 2″ leaves, but it’s impossible to know for sure how many pieces will be signed. What combination should you get? It’s impossible to know for sure how many pieces will be signed. We do have some suggestions based on our experience. 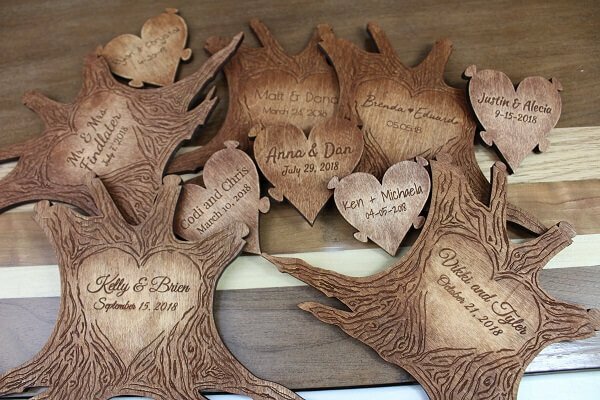 For a wedding, you probably want the 1.75″ or 2″ pieces as they allow a bit more than just a name to be written on them. 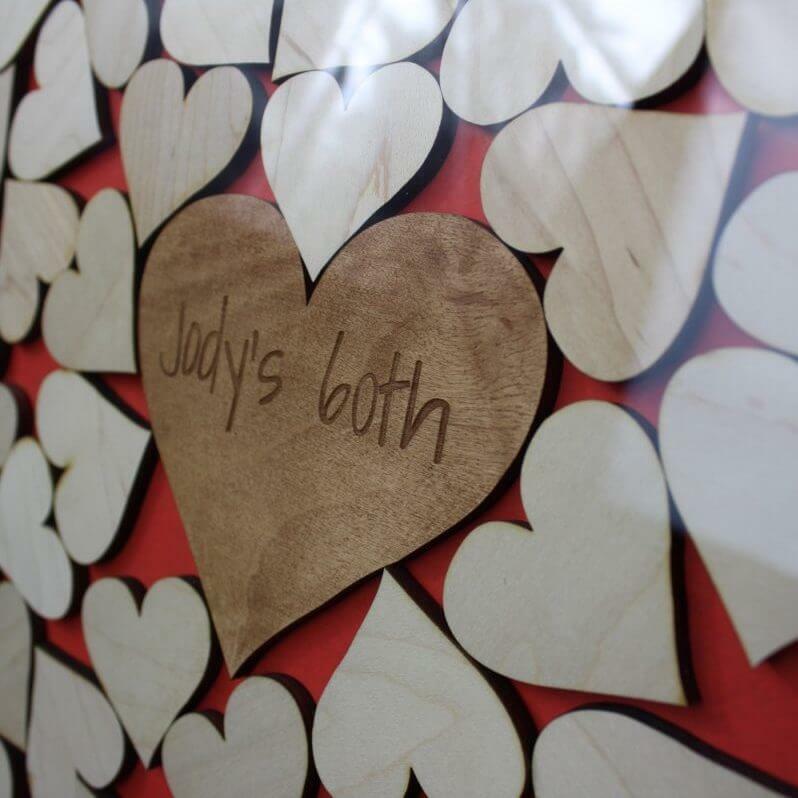 We’ve found typically 50-75% of the guest number is the number of pieces which will be signed. Couples tend to sign a piece as a pair and often people just don’t sign. Again, it’s impossible to know for sure how many pieces will be signed and this is just a suggestion. Three colors to choose from: black, grey, or white. Any color of your choosing can be hand painted.